I will try to start blogging a bit more often. I took about a two week WoW break towards the end of April–I didn’t drop my subscription, just didn’t log in–and that caused some of the break. The dailies stress me out, Y’all. Sometimes I can’t muster the will to play end game and that limits me on topics to write about. I played some Diablo III and killed Diablo again instead. I also got busy in WoW after my break. I was too busy to write because I had no extra time. So…what did I do in WoW to take up so much free time? I leveled my first ever Horde character to max level. I really need better transmog gear. This is Tabby, you might recognize her from my guide to getting attuned to Molten Core. Tabby and I go way back. I created her in September of 2009, about a month after I started playing WoW. She was the first Horde character I ever made. 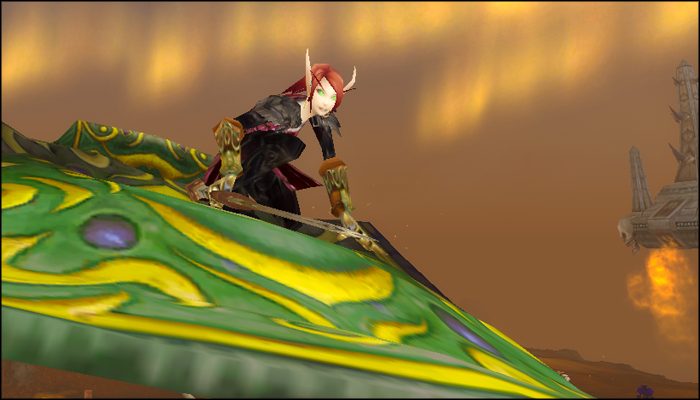 She is also the third character I ever made in WoW – so she is one of my original kids. This post is mostly about her to celebrate her finally hitting max level. I leveled her to about level 15 and then got distracted by finally hitting level 80 Alliance side. Even though I loved Silvermoon and Blood Elves in general, my guildies were Alliance and I liked playing with them. So my Belf Pally stayed parked in Silvermoon near the paladin trainers. She stayed there for a long time. In the meantime my altaholic tendencies bloomed. I acquired a few more level 80s and soon my server was almost completely full. This left me conflicted because Cataclysm was coming and I wanted to make a gnome priest but had no room. I also wanted to make a Worgen and there were Goblins too! It might seem silly to pay to transfer a level 15 character, but I liked Tabby and didn’t want to delete her. This is the oldest picture I have of her. It was taken in September of 2011. Once Cataclysm hit, she started to be leveled again when I had spare time. I didn’t play her (or my Alliance pally) often because I didn’t like the changes made to paladins. I did have lot of fun seeing the Horde side of the story when I played though. This picture was taken in Un’Goro Crater. 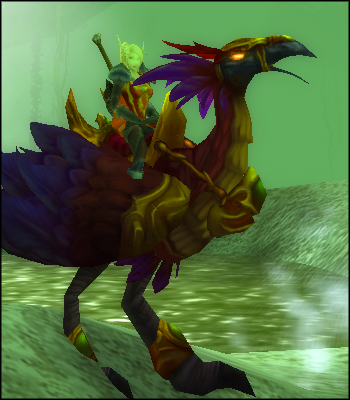 I apparently loved the hot springs there because I took about 30 shots of her there on different bird mounts. Her hair was originally pale blond. I wanted to change it to red for a long time, but I couldn’t find a barbershop Hordeside. To this day the only Horde city I am comfortable in is Silvermoon and it has no barbershop! Which is really odd if you think about it. Tabby has always had her hair in a ponytail and she probably always will. It is a nice practical hairstyle for a holy warrior who judges her enemies. 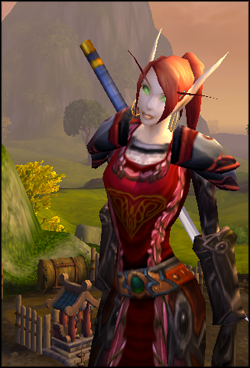 I call her my evil paladin because she is Horde, but she isn’t really evil. (Nor is the Horde, that is just me being silly.) She was a paladin back when the Blood Knights kept a trapped Naaru in their basement and used it for power though, so she isn’t exactly “good’ either. This was taken in April of 2012. Somewhere over Borean Tundra. Finally she made it to Northrend and discovered the holy grail–a barbershop!–in Dalaran. Her hair has been fiery red ever since. I slowly kept leveling her. She was level 83 at the end of Cataclysm. Mists was very alt unfriendly when it started. Suffice to say I worked on Tabby when I could. She got up to level 88 in March of this year and stayed there a while. I took time out of actual leveling to visit Molten Core and Blackwing Lair with Tabby in order to chase battlepets. Silvermoon is the prettiest city in the game. It is also where Tabby lives when she isn’t busy fighting evil. 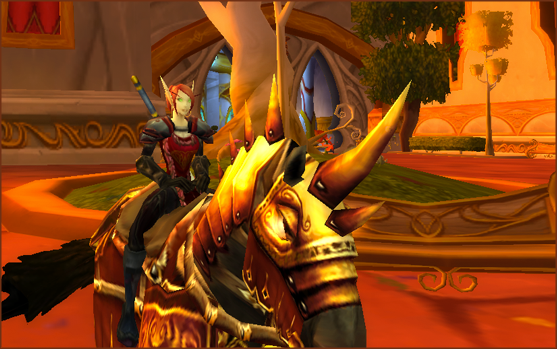 I decided I really wanted to see the Horde side of patch 5.1 and started leveling her in earnest after my April break. I surprised myself and got her from 88 to 90 on one long Saturday. Finally I had my second level 90 and my first max level Hordie! Congrats on your first 90 Horde! And I gotta agree, Silvermoon is truly a breathtaking place. Even as a Forsaken I tend to conduct all my business there.